Paul Lasiter will be brand new to Montana when he starts work at the University of Montana, but he’s familiar with the university’s story – and what the institution has to offer. Helping tell that story will be part of his job as UM’s new vice president for operations and finance, come January. “The next thing I want to do in my life is work in a great place, with great people, doing great things,” Lasiter said in an interview with Missoula Current. After a nationwide search, Lasiter beat out two competitors earlier this month. He’ll leave Pepperdine University to take the new Missoula post. In Missoula, he’ll oversee many of the university’s operations: financial planning, analysis of resources and generation, budgeting and planning. He’ll focus on several key areas, too, including campus safety and human resources. Lasiter was the chief financial officer and vice president of finance and debt capital markets for Pepperdine’s five colleges and schools, nearly 8,000 students and an operating budget of $530 million. He has more than 25 years of experience in finance, operations, accounting, planning and treasury. At the Graziadio School of Business at Pepperdine, Lasiter aided in stabilizing enrollment and created incentives to reward program growth, generating $23 million net tuition revenue growth since 2013. “I already have a 30-year working career behind me. In all that time that I’ve spent, higher education has certainly been the most rewarding of the industries I’ve worked with,” Lasiter said. Lasiter is well aware of UM’s enrollment and revenue troubles, and hopes to help the institution improve its budget and financial standing. While he’s still working on specific details, improving student success is his prime objective when it comes to budgeting. “We’re spending other people’s money, right? We’re spending students’ money and we’re spending taxpayers’ money. We’d better be really, really efficient in the way that we do that. And we’d better deliver on the service that we’re providing,” Lasiter said. Lasiter said that UM President Seth Bodnar’s ideology to put people first matches up with his plans for restructuring and improving the financial budget. “I think that’s wise because if you don’t invest in your people, someone else will,” he said. Montana State University has done well in managing customer relationships and marketing the university’s strengths, he said, but building that relationship with potential students takes time and investment. Now that UM is focusing on those relationships and has fresh leadership, the future looks bright, he said. It’s about telling a story and being responsive to students’ needs. “If I can be a part of helping encourage and attract those students, to a great place like the University of Montana, where I think they’re going to get a great experience with great faculty and have the support of people like President Bodnar behind them, that’s a great thing. That’s something I want to do,” Lasiter said. Pepperdine is a private institution and about 77 percent of its revenue comes from students. There is no state-appropriated funding for Pepperdine. Taking into consideration that students accumulate debt to attend college must be at the forefront of financial conversations, Lasiter said. About 40 percent of high school graduates in Montana don’t continue on to higher education, and that’s a problem. “I think it’s good to ask yourself, is it good for us to be spending this money in this way knowing that a student is going to be paying this off over the next 10 to 20 years? And, wow, that tends to put things into perspective,” he said. At a time of declining enrollment, providing all the services that students need and investing in the university’s future can be a tall order, but not an impossible one, Lasiter said. 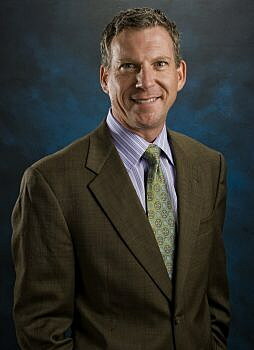 “[The University of Montana has] much more diversified sources of revenue than I’m used to dealing with at Pepperdine, which is a real strength because you don’t have to lean as heavily on one particular source of revenue to make sure you have the resources you need to deliver the service you want to deliver,” he said. While visiting the university for interviews, Lasiter went to his first rodeo, a Missoula Osprey baseball game and a Griz football game. Missoula is an amazing place to live, he said, but delivering that message is vital to the institution’s success. Pepperdine has an acceptance rate of about 37 percent and is ranked among the top 50 institutions in the country. Even with high credentials, the university still invests quite a bit into advertising and marketing. All universities have to, Lasiter said. “If we get people to come, get people to check it out, they’ll see it, they’ll feel it, experience it, and hopefully they’ll have the same kind of positive feelings I’ve got and the potential I see,” he said. President Bodnar is excited for Lasiter’s arrival after the start of the year, and is confident in UM’s future plans. “I am excited that Paul is joining our team and that he is doing so during such a critical time at the University of Montana,” Bodnar said. “He is an experienced and thoughtful leader whose facility in managing the financial operations of complex organizations will serve UM well.